Come by early to view new work by local artist Bree Zorel in the gallery. You'll have a chance to check out the workshop room across the hall and all the amazing art materials and equipment we've received in donations. There will be live music upstairs and a surprise workshop too! The gallery and workshop room will be open from 6-9pm. Their first every age show will start in the gym at 7pm. Five local Calgary bands and all by donation. 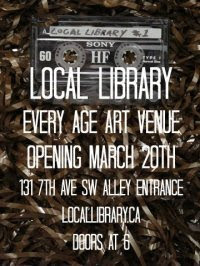 Local Library is housed at Central United Church at 131 7th Ave SW and is accessible by the alley entrance between 7th and 8th Ave. Be there or be square!